Friday January 1st 1904 Will churned for me. I got the work done and dinner in good time. We went down to Uncle Jims for my two turkeys after dinner were not gone long. I sewed some after I came home. I wrote to Flora Culbertson in the evening. weather growing colder again. Saturday January 2nd 1904 I was busy all forenoon with the work did some baking and sweeping. I finished my waist in the afternoon. Very cold day. I read all the evening. The man went down to the City. 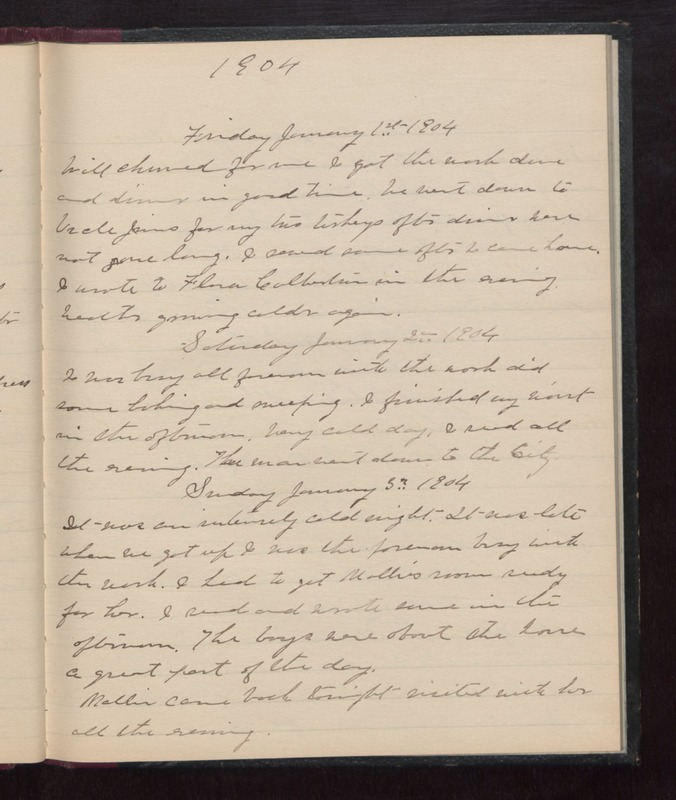 Sunday January 3rd 1903 It was an intensely cold night. It was late when we got up. I was the forenoon busy with the work. I had to get Mollie's room ready for her. I read and wrote some in the afternoon. The boys were about the house a great part of the day. Mollie came back tonight visited with her all the evening.